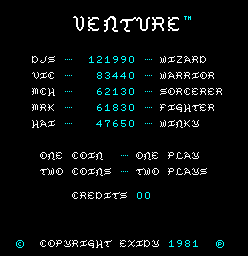 Venture is an arcade game developed by Exidy in 1981. The player controls archer Winky, represented on the screen as a face with a bow. The game contains two views, a zoomed out view of the entire floor, and a zoomed in view of each particular room on the floor. Enemies exist inside and outside of the room, and the player must avoid contact with all of them. Winky's job is to enter a room, claim the treasure inside, and get safely out of the room. When outside of a room, he must navigate the hallways until he reaches the door to an open room. Large invincible monsters roam the outer halls, while smaller destructible monsters guard the treasures in each room. When all four rooms of a floor have been cleared, Winky moves on to a new, more difficult floor, through three different floor plans. Venture's joystick was pressure sensitive, able to distinguish between a heavy press that was intended to move Winky in one of eight direction, and a light press intended to merely change Winky's orientation without moving him. 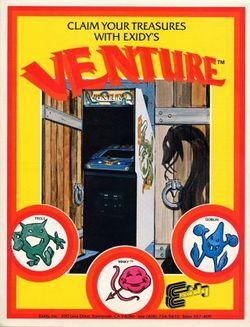 Venture was one of three games that Exidy licensed to Coleco for home conversion, along with Mouse Trap and Pepper II. Coleco released Venture for play on their own system, ColecoVision, as well as for competing systems, the Atari 2600 and Intellivision. Winky is an archer and treasure hunter extraordinaire. A nearby abandoned castle holds many treasures and mysteries in its dungeons, but it has become overrun with monsters. No person has succeeded in pilfering its depths, and Winky intends to be the first. You control Winky as he searches for treasure. Winky can move in eight directions, and fire an arrow in whatever direction he faces. Winky's goal is to collect every treasure from all four rooms on each floor. When Winky collects the treasure from a room, the room is closed off. When Winky collects every treasure from every room, he advances to a new floor. Winky must avoid contact with any room monster and the giant hall monsters. Winky can fire arrows at, and kill, any room monster, but he can not kill any of the hall monsters. This page was last edited on 21 December 2009, at 01:28. This page has been accessed 10,412 times.